Like many Labour Party members, I was surprised and concerned this week to hear Ken Livingstone, the co-convenor of Labour’s defence policy review, announce live on the Daily Politics that the review would examine Britain’s membership of NATO. The Labour Party quickly put out a statement dismissing Ken’s comments, outlining that NATO membership would not be up for consideration. Jeremy Corbyn, during the Labour leadership campaign rightly toned down his rhetoric on NATO membership, referring to the fact that the public had no ‘appetite’ to leave. Ken’s comments are important, because when we reflect on Corbyn’s past public statements regarding NATO, it could be construed that Livingstone may be reflecting the leader’s office private views. NATO does have it’s faults, the military campaign in Libya had devastating consequences, leaving a country with a power vacuum and millions without a home. The refugee boats sweeping up on the shores of Europe can largely be traced back to the destabilisation caused to the horn of Africa. However, we must not forget that NATO has maintained the security of Europe for over half a century. Russia’s annexation of Ukraine and their recent involvement in Syria reminds us of the importance of NATO. We live in an uncertain world, even though the iron curtain that once divided Europe no longer exist, threats to our security from the east still remain. 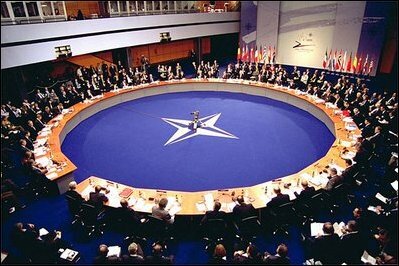 Pew Research Centre revealed that support for NATO among the British public is strong, with a majority of people viewing our membership favourably. That is why Livingstone’s comments is a huge cause for concern, NATO is an issue which we do not need to be opened. With pre-existing divisions within our party over extending military airstrikes into Syria and the issue of renewing trident, at this stage to open another fault line would be a huge error. It is also important for us to reflect on the fact that it was Ernest Bevin, Foreign Secretary in the post-war Labour government who contributed to the creation of NATO. Attlee believed that we had a duty to our allies, to stand with them in their time of need. We cannot forget our past, the Labour Party at its core is an internationalist party. Therefore, let us not preoccupy ourselves with inward debate and aim to move the focus away from foreign policy toward important domestic issues. We have George Osborne mismanaging the economy, parts of Britain remain flooded and a Conservative party openly divided over Europe. We must continue to hold the government to account, and defend the public from austerity.